Continuing on a theme of painting things that will only rarely be seen, today a little progress post on the interior of the Reaver. 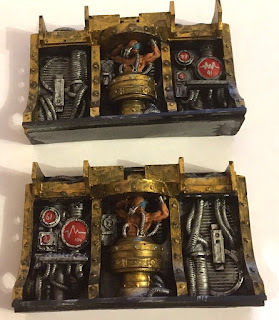 These are the servitors that line the interior walls of the main (upper) part of the titan. Goodness knows what they are actually supposed to be controlling - the primary weapons perhaps? Not too sure to be honest. Their pose, sculpt, and aesthetic is positively grim and dark though. For the painting colour scheme, I've opted to go for something a bit noir as I felt it went well with the grim depictions. The whole pieces are a combination of faded gold and brass colours combined with a black background. This creates a very "sued" vibe which was what I was going for. The human servitors have been picked out in fleshy tones. In hindsight, I might have gone for something a little more subdued and less obviously fresh (not quite Nurgly tones, but perhaps anaemic looking). The computers in the background have also been picked out. I simply opted for a pulse-like monitor with some numbers on the screens. I intend to carry over this pulse theme to the cockpit of the titan, rather than making the computer screens in to some kind of pseudo-view port to the outer world. The reason for this is that I feel all the technology wired in to the Princeps means that such monitors are not required. Overall, I am happy with how the gold colour has come out - the shading in particular is very pleasing, along with the weathering. I'm less happy about the servitor though, and one of the computer screens ("91") the brush messed up on me a bit, so I ended up with larger lettering than was intended. Regardless, these are now ready to be installed in the main interior and the progress of the titan is coming along in leaps and bounds now.